Sculptor Jeff Briggs designed a cast of local Boston animals to adorn the centerpiece of the new Tiffany & Co. Foundation Grove. By Olga Khvan·	 8/13/2013, 4:22 p.m.
You won’t be able to ride a horse on the new Greenway Carousel coming soon to the Rose Kennedy Greenway Conservancy, but you will be able to ride a skunk. 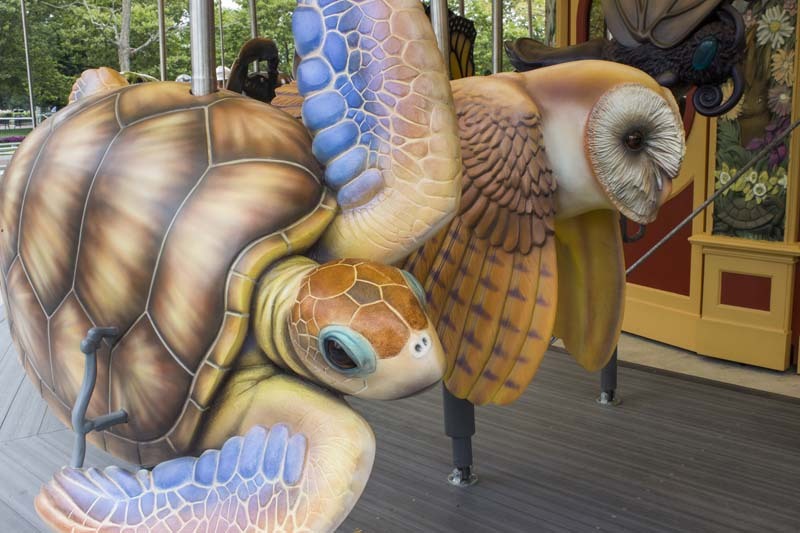 The new carousel, set to open August 31, acts as the centerpiece to the new Tiffany & Co. Foundation Grove, and it boasts a colorful cast of characters comprised of animals seen in and around Boston. Among the land creatures, a squirrel—often seen scurrying around the Greenway and the Common—and a grasshopper matching the symbol on the weathervane atop the nearby Faneuil Hall Marketplace. 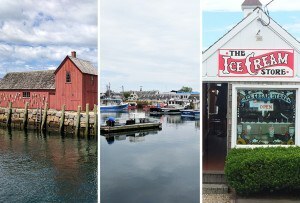 Among the sea creatures, a cod—the state fish of Massachusetts—and a whale resembling those seen from the whale watching boats leaving Boston Harbor. And among the air creatures, Briggs’s favorite piece—the peregrine falcon, a local bird that has been spotted nesting atop the Old State House. 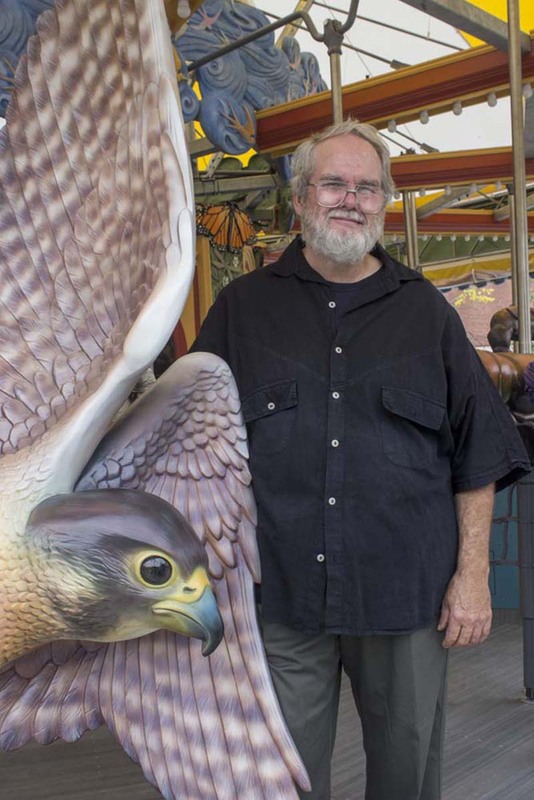 SCULPTOR AND DESIGNER JEFF BRIGGS WITH HIS FAVORITE PIECE, THE PEREGRINE FALCON. 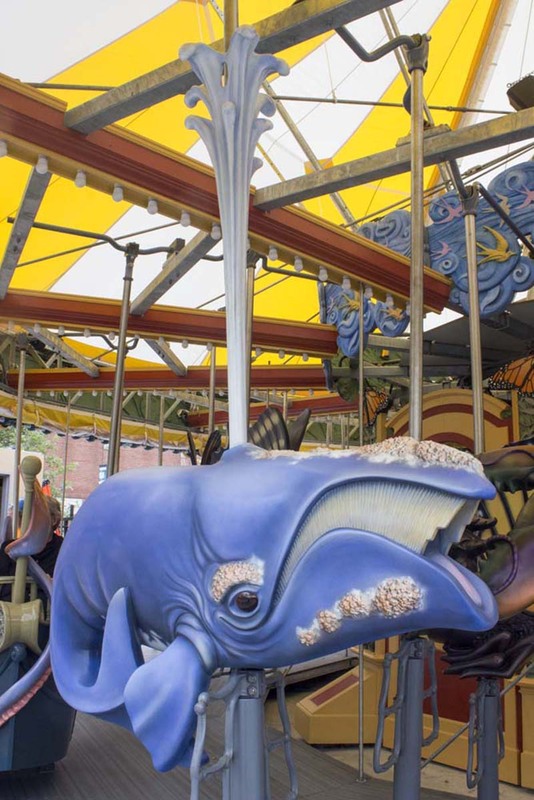 Briggs, a native of Newburyport and alumnus of Tufts University and the School of the Museum of Fine Arts, has spent the last three years researching and bringing to life the 14 characters now adorning the carousel. 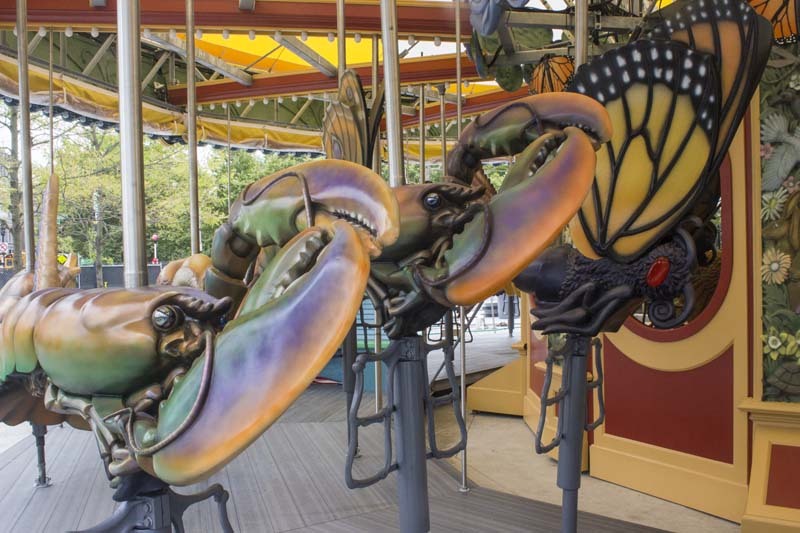 To select which characters were added to the carousel, Briggs and the Rose Kennedy Greenway Conservancy recruited some help from the Boston residents most likely to line up for rides: children. 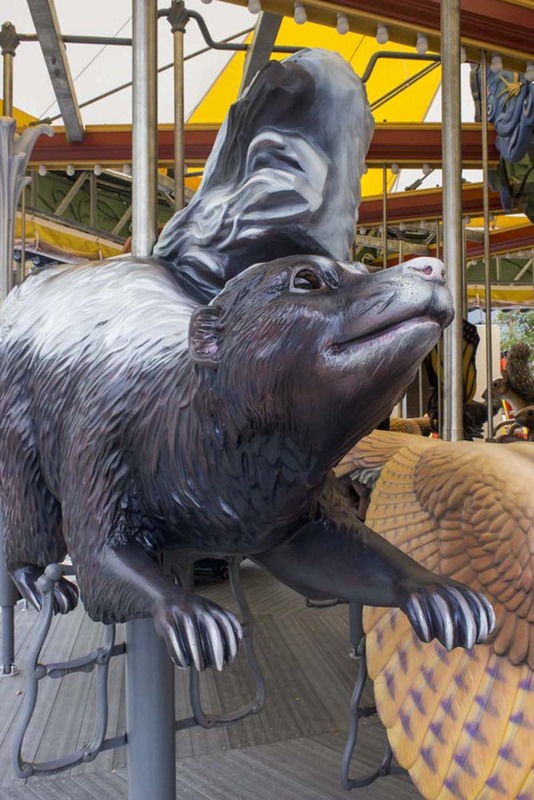 Conservancy members asked students in four local elementary schools—James F. Condon School in South Boston, Roger Clap Elementary in Dorchester, the Eliot School in the North End, and the Advent School in Beacon Hill—to draw animals they would most like to ride on the carousel. After collecting 175 drawings, they looked for consistent themes in the children’s choices. Briggs is very experienced in carousel art, having been the main sculptor and designer of the Detroit River Conservancy carousel and having worked at the Fabricon Carousel Company of New York City for more than 25 years, creating carousels operating throughout the world. For the new Greenway Carousel, he was also responsible for carefully arranging the pieces, as well as integrating them to fit into the frame. The spout coming out of the whale piece, for example, doubles as a pole. The innermost row consists entirely of butterflies whose wings are sticking up—a seemingly minor, but actually considerate design choice. THE SPOUT FOR THE WHALE WAS CLEVERLY PLACED OVER THE POLE. HANG ON TIGHT! The entire carousel itself will add a new element to the Rose Kennedy Greenway Conservancy, serving as the centerpiece of the new Tiffany & Co. Foundation Grove. 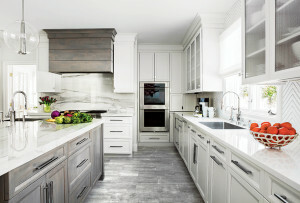 In addition to the carousel, the grove will include movable furniture—tables, chairs, and umbrellas meant for people to create their own spaces—as well as food carts serving maple sugar cotton candy—a classic with a local twist, according to Jesse Brackenbury, the conservancy’s COO. “It will be a wonderful addition to an area that’s already buzzing with activity, marking a nice transition from the commerce of Faneuil Hall to the waterfront,” he said. 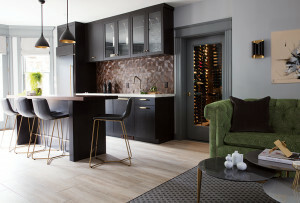 The landscape of the grove has been planted with 25 new trees—honey locusts, Kentucky coffee trees, pin oaks, swamp white oaks, and large leaf green shadow magnolias—which create a buffer from the hustle and bustle of the surrounding streets. 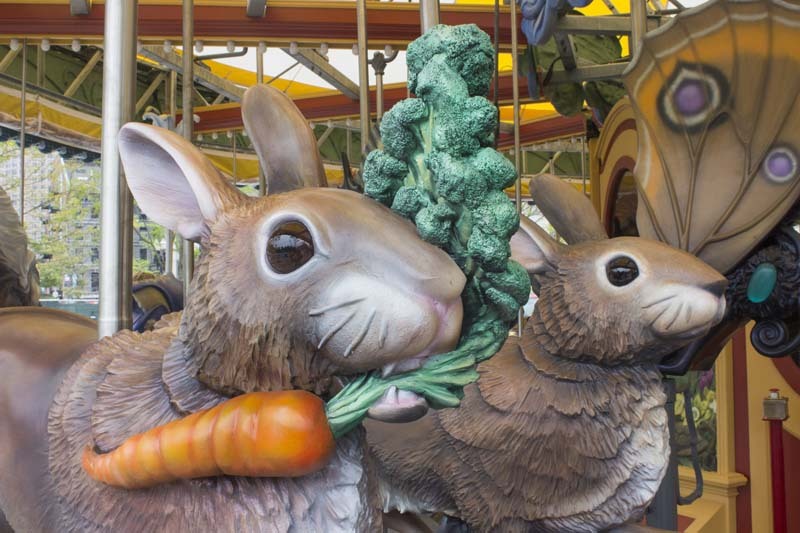 Below, check out the critters you’ll soon be able to ride on the Greenway Carousel. A PAIR OF RABBITS ON THE RUN. WHAT’S A CAROUSEL IN NEW ENGLAND WITHOUT SOME LOBSTERS? 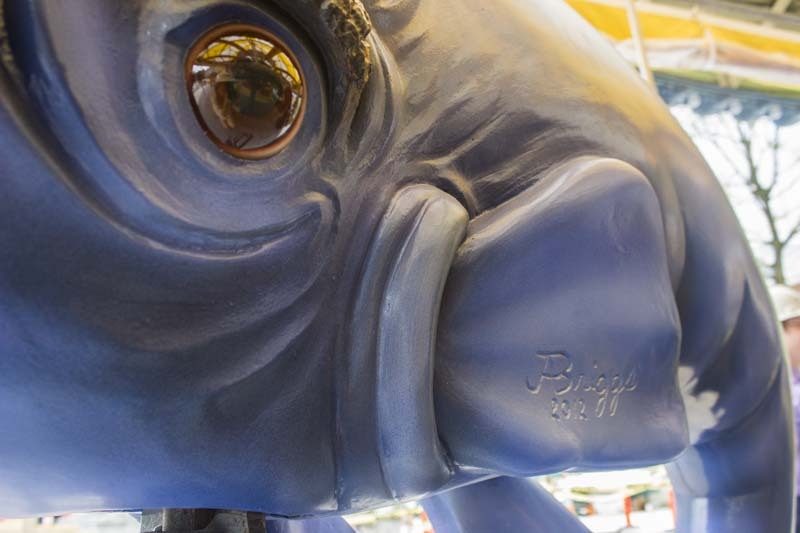 CLOSEUP OF THE WHALE PIECE, WITH BRIGGS’ SIGNATURE. The carousel will open to the public at 10 a.m. on August 31, with a ribbon-cutting ceremony and an inaugural public ride. It will stay open from 11 a.m. to 9 p.m. daily, weather permitting, through Halloween and on weekends in November and December. Tickets will be available for purchase on-site for $3.